There's nothing quite as satisfying as cooking a delicious meal that comes together flawlessly and easily with minimal ingredients and mess. That's why I love making fish. Some people tend to shy away from it, thinking that it's difficult to prepare--for some reason, seafood tends to give that impression. In actuality, good, fresh fish needs almost no preparation--just a few simple seasonings and a bit of time on a fired up stove or in a hot oven. The natural flavors are so good, it doesn't need a lot of fuss. For each of the 4 packages, place one 12-inch-long sheet of aluminum foil on top of another. 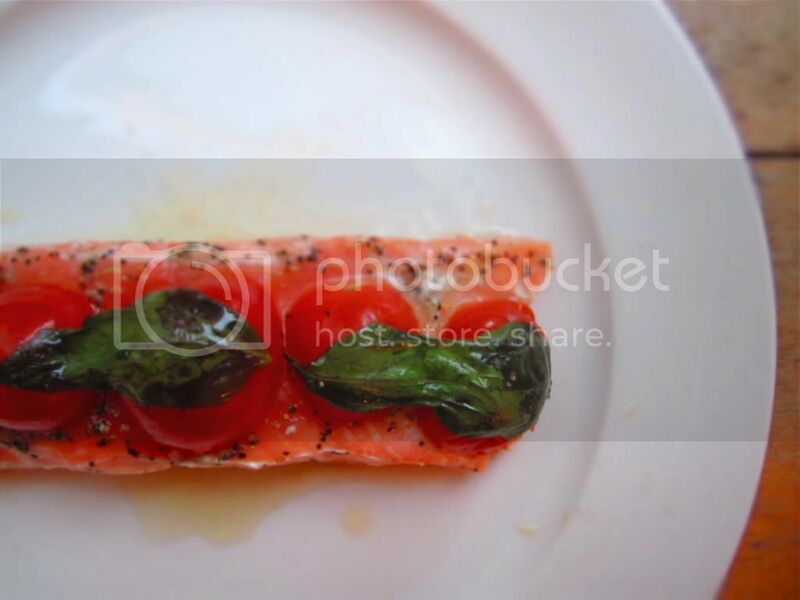 Smear top sheet with ½ tablespoon olive oil and layer a fillet of salmon, 6 tomato halves, salt and pepper to taste, 4 basil leaves, and another ½ tablespoon oil on it. Seal the package by folding the foil over itself and crimping the edges tightly. Refrigerate until ready to cook, no more than 2 hours later. When you are ready to cook, heat the oven to 500 degrees. Place the packages in a roasting pan. Cook for 5 minutes, for medium-rare, to 8 minutes from the time the oil starts to sizzle, roughly 10 to 12 minutes total. Let the packages rest for a minute, then cut a slit along the top of each with a knife. Use a knife and fork to open the package, and spoon the salmon, garnish, and juices onto a plate. Oh my gosh this looks so amazing! I cant wait to try this. So glad you (and the bf) liked it!